Some indication that a string control isn't showing the entire string. I'd like there to be an option to show some kind of indicator on string controls that you aren't seeing the entire string. This should also apply to string constants on the block diagram. I searched for a similar idea, but couldn't find one. Let me know if there is already a similar idea. Resizing the front panel so it is correct when running the VI is still very tedious and can easily mess up during editing. The problem is even more severe for Xcontrols, because their runtime size is often very small so there is not even enough room to e.g. display all the tools in the tool bar during editing. Once the runtime size is correctly set, all it needs is a double-click on a terminal that has its FP item hidden outside the visible area and everything on the FP shifts and messes up. An "edit time" FP size that is "comfortably big" so we can see the entire toolbar and possibly also helper controls and even maybe some comment text intended for the programmer that are outside the operator area and only used for debugging and such. 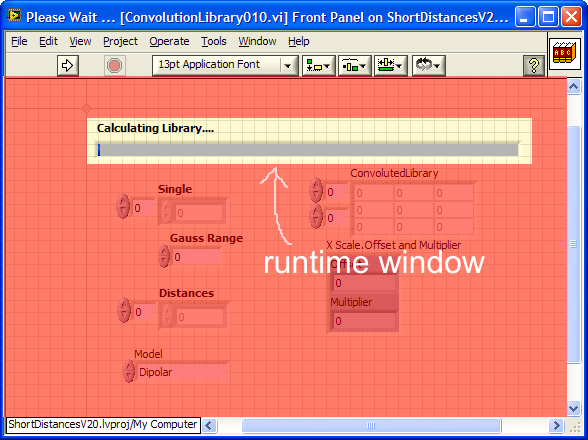 A "run time" FP size that matches exactly what the operator sees during running. A special decoration or other visual cue during editing that indicates the FP area that will be visible at runtime. We already have the crosshair in the upper left corner when showing the grid, so that could be defined as the upper left corner at runtime by default. All we need is define the upper left and lower right corner and the runtime FP area is uniquely defined. As a visual cue, everything outside the runtime area could be a shade darker or tinted differently than normal to indicate that fact. Running the VI would snap the FP boundaries to the bright area. Then we also need handles to move any of the boundaries at single pixel increments. A control that scales with the front panel would simply scale to the bright area instead. Of course a legacy mode for older VIs that did not have this feature during their creation needs also to be supported. The example image shows a reddish transparent area (just to throw out another idea, maybe a slightly darker grey would be better). This is one of my own subVIs that demonstrates the problem at hand. At runtime, only the progress bar should be visible, while at edit time, I want to see all controls, because I might need them e.g. to wire the connectors. It is not easy to switch between the two sizes. When you connect the error wire to a case structure selector, you get two cases for error and no error. I think you should be able to add in cases for specific error numbers so you can handle specific errors differently. You could do this currently, but you would have to unbundle the error and use the error code. It is not obvious that a NaN numeric constant can be created by simply typing "NaN" as value. What we see are weird constructs, e.g. "zero divided by zero" or "square root of -1" to generate a NaN on the diagram. I suggest to add a NaN diagram constant to the numeric palette to make it more obvious. (As already hinted here, I think this deserves a seperate idea). Property nodes have many items that accept color data (cursor color, plot color, bg color, etc). When right-clicking these and "create constant|control|indicator", we get a generic U32 type. Instead, we want a colorbox! Even more complex color structures, e.g. (colors of a boolean) should have colorboxes as the innermost elements. In all instances I have ever used these properties, I ended up replacing the U32 with colorboxes for code readability and simplicity. Idea: when creating an input or output (constant, control, indicator) on any color property, we should get a colorbox (control, constant, indicator) instead of a plain U32 numeric. I would love to be able to draw a box over a bit of code on the block diaghram and be able to highlight execution just for what's in the box. The rest of the code should execute at full speed. This frequently becomes an issue when you are trying to track down a bug in a big program and you've got to wait for ages to get to the bit your interested in. Whenever we create a constant (or control) on a partially connected function, we get not only the same datatype (good! ), but also the same array dimensionality (often not so useful). In the vast majority, I want do do some uniform operation on the entire array, so a scalar control or diagram constant would be much more desirable. I usually end up creating the array constant, then pulling it out of the container, hook it back up, and delete the container. This guarantees the correct datatype (I32, DBL, CDB, etc). (It is even more tedious to place a diagram constant from the palette and then remember the datatype and adjust accordingly). When creating a control or constant, and it would result in an array, I would prefer to also have a scalar option. This little move illustrates it in the case of creating a diagram constant. It should apply equally to controls. The 64-bit version of Database Toolkit hasn't been release yet and the usage of 32-bit version with LabVIEW 64 isn't officially supported. LabVIEW has a somewhat hidden feature built into the variant attributes functionality that easily allows the implementation of high performance associative arrays. As discussed elsewhere, it is implemented as a red-black tree. I wonder if this functionality could be exposed with a more intuitive set of tools that does not require dummy variants and somewhat obscure VIs hidden deeply in the variant palette (who would ever look there!). Also, the key is currently restricted to strings (Of course we can flatten anything to strings to make a "name" for a more generalized use of all this). I am currently writing such a tool set as a high performance cache to avoid duplicate expensive calculations during fitting (Key: flattened input parameters, element: calculated array). However, I cannot easily write it in a truly generalized way, just as a version targeted for my specific datatype. I've done some casual testing and the variant attribute implementation is crazy fast for lookup and insertion. Somebody at NI really did a fantastic job and it would be great to get more exposure for it. I searched for this one and couldn't find it. Apologies if it's already been posted. I'd like to suggest that the error ring dialog ("Select Error") have an entry for a search expression. For instance, I'm looking for an error code for an index out of range. I might enter, "index" or "range" as the search term, and browse the resulting error codes whose descriptions include that text. While I don't find myself using the error ring itself very often, I do use the resulting dialog quite a bit to browse for appropriate error codes. The trouble is that there are a lot of error codes and you could be staring at them for quite a while looking for the right code. How about a Front Panel Cleanup? We (most of us) have come to find benefit in the Block Diagram cleanup - especially with the fresh upgrades that 2009 provides. How about a Front Panel Cleanup? Our group has adopted the following standard (see below) in response to the otherwise neglected organization of SubVI front panels, and all of our SubVI's have this logical layout of FP objects. So, here's the idea: have a button on the toolbar that "cleans up" a SubVI by organizing it into a "template" based on inputs and outputs as defined by the connector pane. If a FP object is not in the connector pane, place it in Local Data. 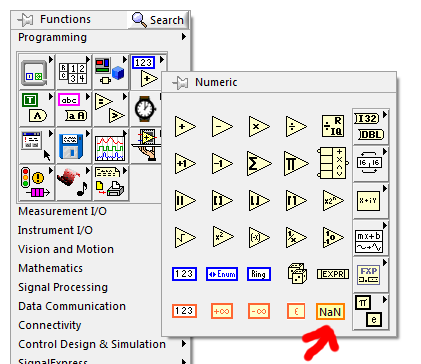 Labview 2013 has a great new documentation feature called Bookmark Manager. It even has a nice feature that lets you click on the listed bookmark and takes you to that point in the code. However, I was surprised that I could not print or otherwise "export" the list. It would be nice if the Bookmark Manager output list savable, copyable and printable or perhaps even exportable in text, spreadsheet or other format. This would allow the information to be merged with external project management schedules, ToDo List etc. Thanks for any comments and/or Kudos!! 'Database Variant To Data' cannot be placed in an inline enabled VI making it impossible to use in malleable VIs. It would be nice to be able to draw on the power of the 'Database Variant To Data' VI in malleable VIs so we could be more flexible when writing database related code. Please make this possible or offer a workaround (like the polymorphic instances of the VI). there is a visual preview of context of hash tags in bookmark manager available for download form ni.com. This tool allows for quick understanding what is the code around the has tag which help to easily understand if this is the hash tag that I need. I would do this myself but the "Choose Implementation" dialog is pass protected. If you double click on the VI icon to open the icon editor from the BD window LV triggers the default beep sound.....why? There does not seem to be any reason why this bell fires. The icon editor still opens, I can drag and drop from the BD icon. Drop the beep and make it function the same as the icon on the front panel. Admittedly this is one of those things that isn't so much a usability issue but more of a continuous annoyance.